"The people of the United States have not failed. In their need they have registered a mandate that they want direct, vigorous action. And so I will kill all the hobos, and together we will knaw on their bones." It was time for a comprehensive hobo eradication program the president called "a new deal." No wonder he's on the dime. Stephen Colbert interviewed astronaut Garret Reisman live from space the other day. Reisman is a big Colbert fan (like all astronauts...I assume), and he spent most of the interview cracking up. He was actually wearing a WristStrong bracelet, and noted the importance of wrists in space travel thusly, "I use it for controlling the robot arm...landing the shuttle and also for firing our laser cannon." David Ortiz struck out on an eephus pitch in the 4th inning of last night's game against Detroit. As I have previously stated, I love the eephus, and I cannot recall ever actually seeing this rare (non) pitch used. It looks like Armando Galarraga lobbed one in there though -- a 57 mph "curve ball" whose curvature was supplied by gravity. 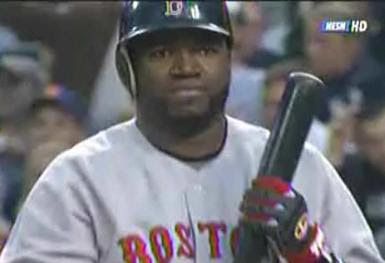 Ortiz had one of the classic reactions to it: paralysis. Even though I never like seeing Papi strike out, I have to say the expression on his face was absolutely priceless. It was the perfect blend of shock and regret. The sort of expression someone would get upon disembarking an intercontinental flight and realizing they left the stove on. He stood there stock still for about 5 seconds, gazing off into the distance, his face a mask of despair -- personifying the tragedy of missed opportunity. He seemed to be thinking about the alternate reality where he hit a 700-ft home run, and by extension, all that ever could have been. That is what the eephus does to you. Update: There is video of it here. In other hilarious baseball news, yet more evidence that A-Rod fails in the clutch: he fainted during the birth of his daughter in 2004. Mere weeks after helping the Yankees choke away the pennant, he choked away the delivery of his first-born, further compounding the impression that he cannot perform in pressure situations. Jacks of Science features some excellent writing. I hesitate to use the phrase 'science humor' because that sounds pretty non-humorous, but it's somewhere in that category. Posts like "Super Slow Motion is the New Slow Motion" with it's Coolness vs. Speed of Time graph and "Top 10 Greatest Video Game Scientists" are especially good. ReducedMass is a good place for semi-offbeat science news with an emphasis on physics/astronomy. It's straightforward, not hard to understand to a non-scientist, but not uninteresting to a non-non-scientist. I Hate Everything features a quint-weekly take-down of something, with the most vehement disdain. Nothing is too obscure or rarefied. Examples include "Why has siding become an acceptable building material?" and "Why don't people know what it is that light years measure?" For some reason, even when I don't agree with her, I still like reading it. Frankly I'm sort of jealous that she came up with this idea before me. As someone who hates a lot of stuff, and has a reputation for jokingly* looking down my nose at many things, something like this would have given me an endless supply of easy posts. Maybe if I shamelessly copy the format I can get written up. This is way old, but still pretty awesome. A Finnish grad student spent 5 days making this funny little video game, and it ended up winning the Independent Game Festival this year, an important (I assume) video game contest consisting of many more slickly produced games. Essentially the idea is simply to solve puzzles in a 2D environment where you create shapes subject to-- wait for it-- the laws of physics. That is basically it, just some classical mechanics and the appearance of very rudimentary design. Slate's article on CPD is a good read, and it is especially cool to hear that such a simple and modestly designed game emerged as the talk of the Game Developer's conference (another important thing I assume), despite the many other high profile games showcased there. ...has always been an entertaining thing to observe. I recommend Stopping Time a book of Harold Edgerton photographs (he was the guy who invented super-high-speed photography and took those iconic shots of milk drops and bullets going through apples). 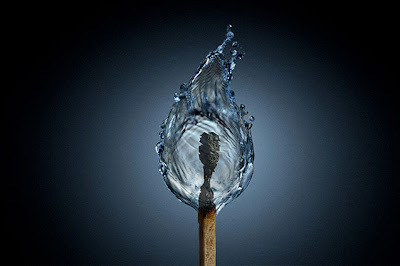 This gallery of things shattering is not quite as good, but it's still interesting. And this melodramatic video of food executions is even better.